It is a hard task to find a professional service for car hire at Malaga airport with a company offering reliable services. Many companies advertise low prices but make you waiting on long queues in front of a desk where a person has to take care of all the arrivals, causing you delays and stress. - Free shuttle bus at the airport (both for arrivals and departures). But, where can I find a company offering all those services? Based on our experience, the best one is Malagacar.com. 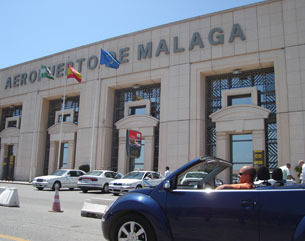 This Malaga car hire company is based in front of the airport, they provide very cheap prices (not a broker), a fleet of brand new cars and an unique return service: when you get back to their office at the end of your stay, they will leave you at the departures hall, so you can be on your way without delay (you won't have to walk from the parking area up to the departures terminal).